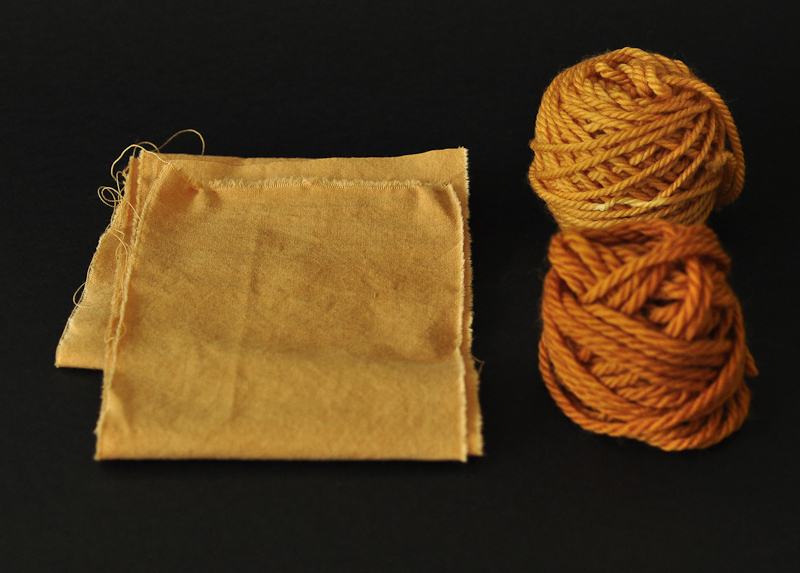 My experience with fustic has given me astoundingly beautiful mustard tones of yellow, which deepen in shade quite quickly depending on the amount of dye used. It’s a very economical dye, a little goes a long way. It is another dye I enjoy the smell of, it’s hard to describe, but the word that springs to mind first is sticky. Which is fitting, because it does create a rather sticky goo when you first add water to it. So it has a sticky tannin smell. Maybe a bit like old dried cow dung? That sounds unpleasant and I’m sure my husband thinks it reeks horribly, but once again I do not. The smell of cows and dirt and grass and trees with a hint of woodsmoke? Maybe none, or all of those things! I shall leave that up to you to decide if you try dyeing with it. Fustic. it looks pretty great on a black background too. Merino yarns, cotton fabric. Fustic works well on all the fibres I have tried. It gives a brighter yellow on alpaca, a bright chartreuse I would call it, and a mustard on merino. 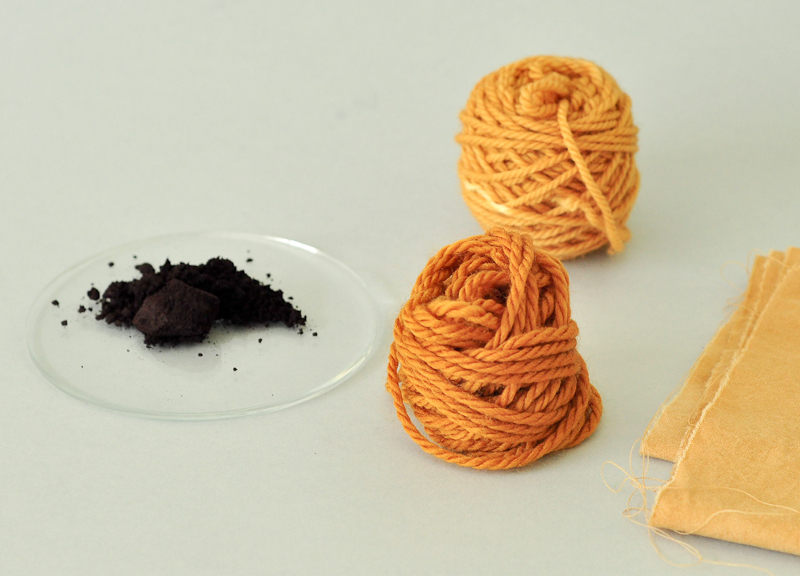 It also gives a mustard on cotton, and like all natural dyes, changes depending on the light. Fustic has that lovely glow that all natural dyes in my experience have. 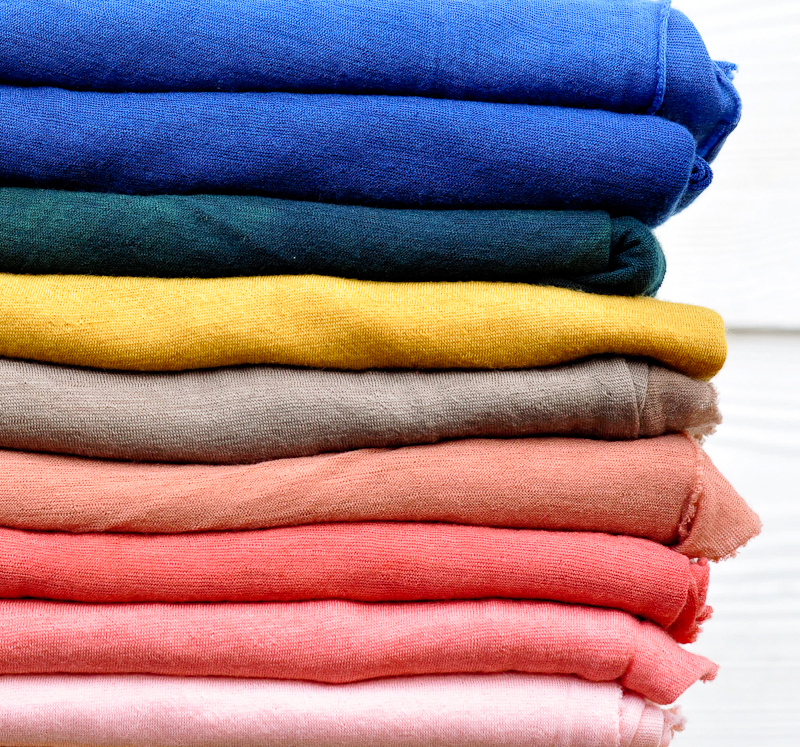 Synthetic dyes just can’t beat it. Fustic has good to excellent wash and light fastness on protein fibres, and seems to be doing well on my cotton too. Last, but not least, when you marry fustic to indigo, you get a beautiful green offspring that is so green, even pine trees get jealous. I’ll be blogging that love story soon.